SONATA (THREE LAKES) was commissioned by and dedicated to flutist Cindy Anne Broz who has become a champion of my flute music in recent years. 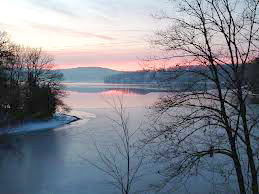 The work is both a formal sonata, and also a programmatic suite depicting lakes that have special memories for me. I. 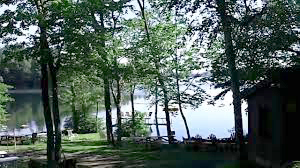 LAKE WALLENPAUPACK is a dramatically beautiful oasis in the middle of the woods in Pennsylvania's Pocono Mountain resort area. It looks like the glacial lakes of Maine even though it's actually manmade. This movement recalls a romantic getaway vacation on Wallenpaupack, and the music blends the free-floating flow of a gentle lake current with a lyrical love song, never quite leaving the feel of the hanging trees hiding the lake's mysteries. II. 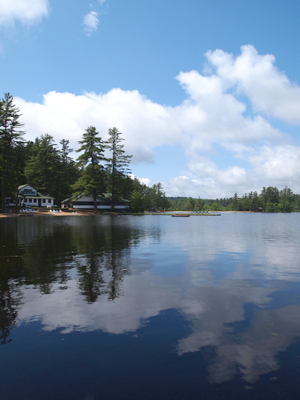 KEZAR LAKE is in southwestern Maine; it hosts many summer cabins including a resort named Quisisana that hires young professional musicians to serve as the staff by day and entertainment at night. My parents vacationed there for over 20 years, and their ashes will live on together in Kezar for eternity. The movement is a memorial to my father who became part of Kezar Lake while the sonata was being composed. III. SALMON LAKE is an exuberant scherzo following the moderate and gentle first two movements. Home to Whisperwood Lodge & Cabins in central Maine, my childhood summers included vacations there, and this movement is a recollection of my frisky 8-year-old self. Salmon Lake remains a mystical memory in a deep way, and a symbol of childhood playfulness. Mvt 3, bar 105; the LH beat 2 should be B rather than C.